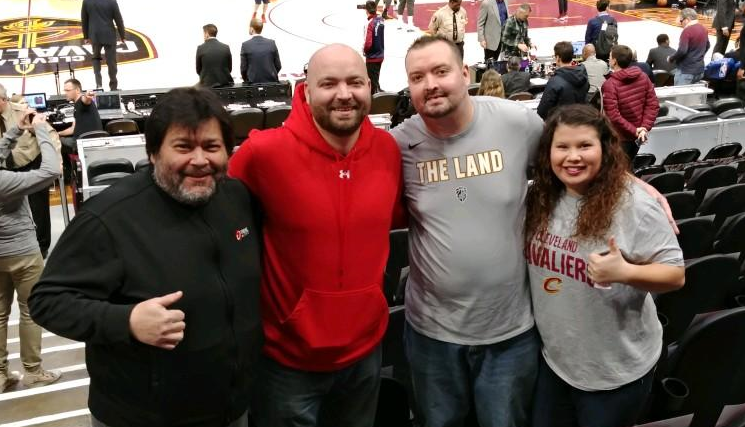 A young man and his family enjoyed a Cavs game. "We had so much fun! Thank you again! Thank you to The JADE Foundation from the Norris Family for these great seats at the Cavs game! Pictured from right to left are wife Rachel, Sean, brother and bone marrow donor Rich, and mom Michele. A young man and his family enjoyed an outing to an Indians game including dining at the Terrace Club. They had a great time! One of our recent outings included a night out at the House of Blues in Cleveland and dinner at Trattoria in Little Italy for a young man and his wife. Our first outing was a winner! 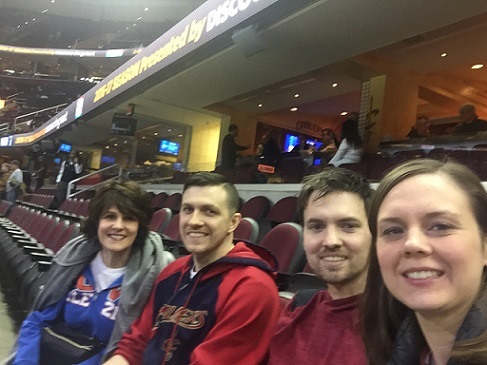 Our young lady enjoyed a night out at a Cavs game - her first game ever, with her family and boyfriend. From her arrival via limo, to the special underground access to the private suite, it was all, as she said "GREAT...it put a smile on all of our faces. 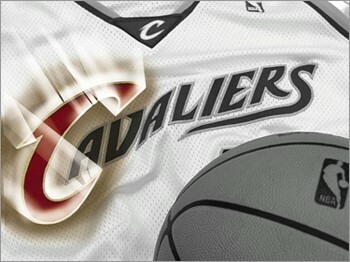 I couldn't have asked for more...Keep it up!" And we promise we will. 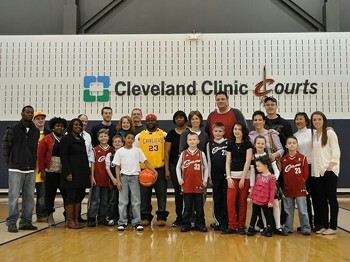 We whisked a few Cleveland Clinic patients off in a limo to visit the $2 million Cavs practice facility. The patients were given the red carpet tour of lockers rooms, training rooms, film room, uniform storage, sauna, to name just a few areas. The highlights included shooting hoops on the practice courts, and eating a delicious lunch at Table 45. A memorable day in March, for all involved, was made possible by great people like you - supporters of The JADE Foundation. Join our mailing list to keep up to date with news, events and opportunities for you to make a difference for our young adult patients. The JADE Foundation is in need of books, DVDs, magazines to add to our Comfort Carts. Learn more about our Comfort Cart Program, and to make a contribution.